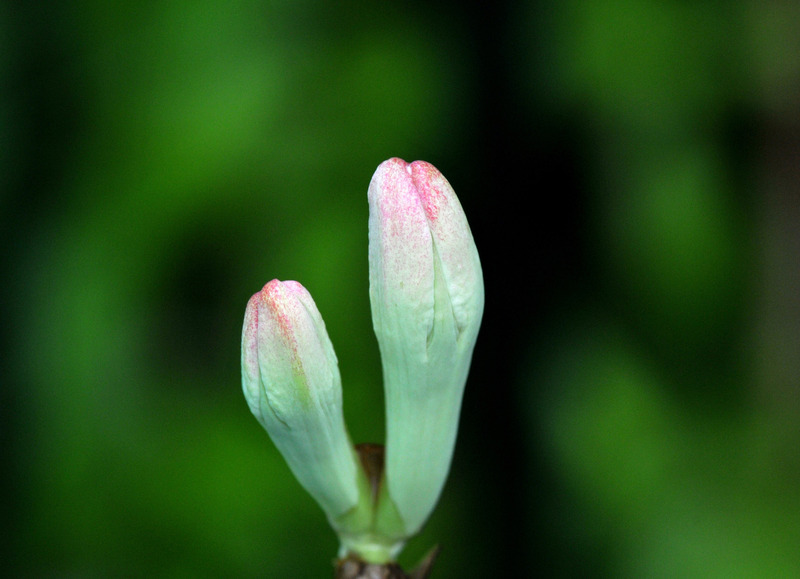 It can grow more than 30 feet in a single season, climb and entwine on everything within its reach. The UPS, FedEx and USPS people no longer drop shipments off on our patio since they are not sure they can go under the thick overhanging vine covering the walkway. My fault! I draped the young vine over the walkway without thinking of the resulting consequences. 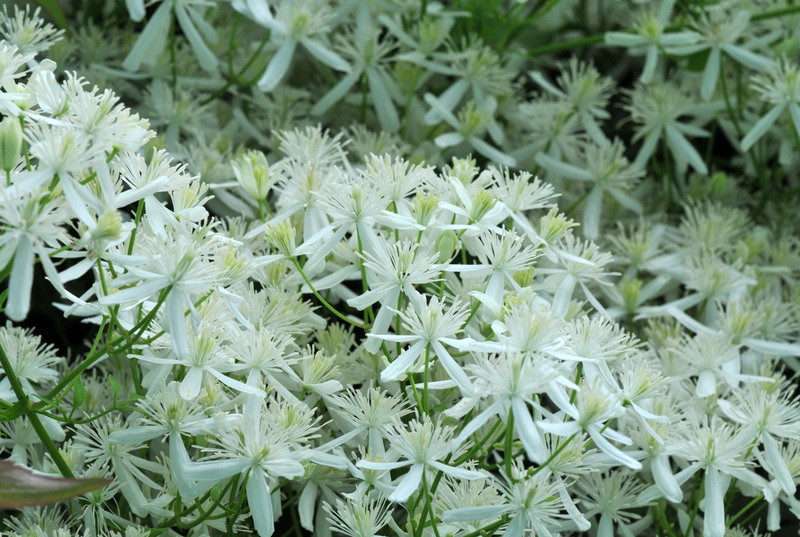 I was describing our Sweet Autumn Clematis (Clematis terniflora). It covers two sides of our patio, providing us with a green screen from summer to late fall. 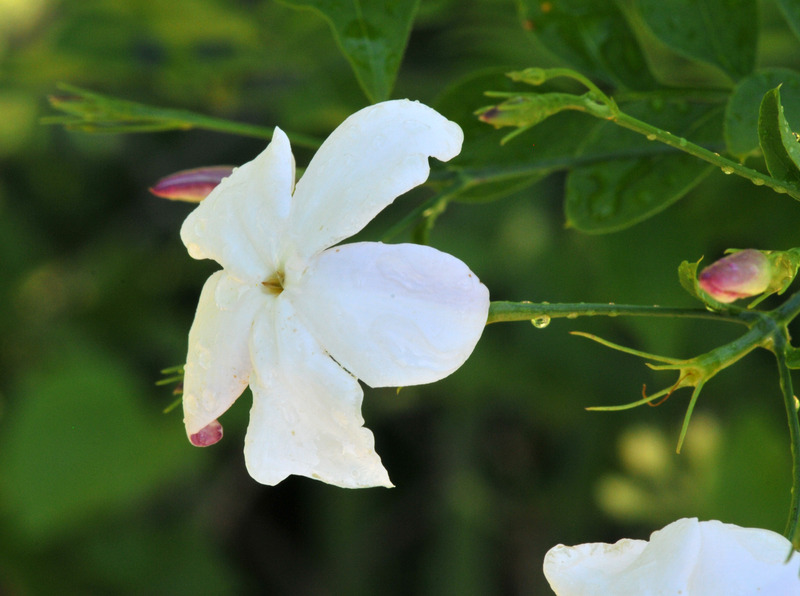 Around late summer and early fall it is blanketed with small white, lightly fragrant flowers, lots of them. 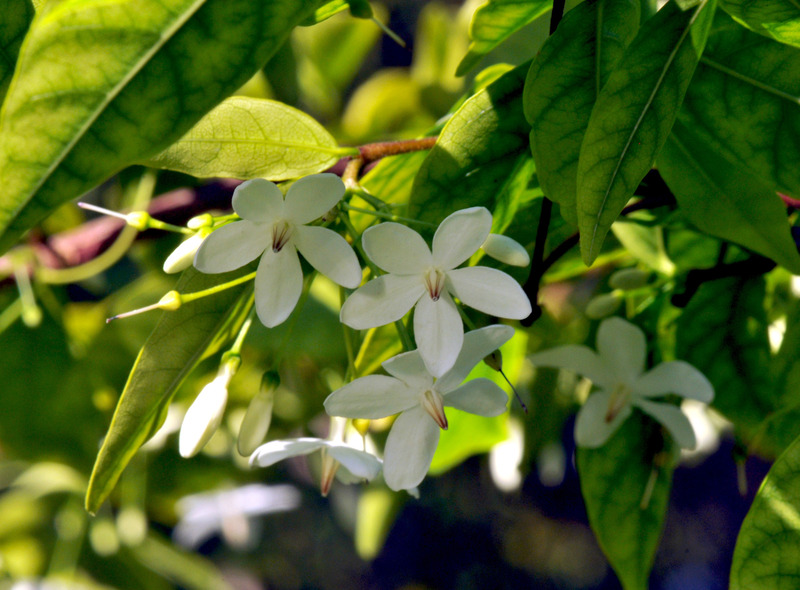 The fragrance is much more pronounced when the temperature is on the cool side. 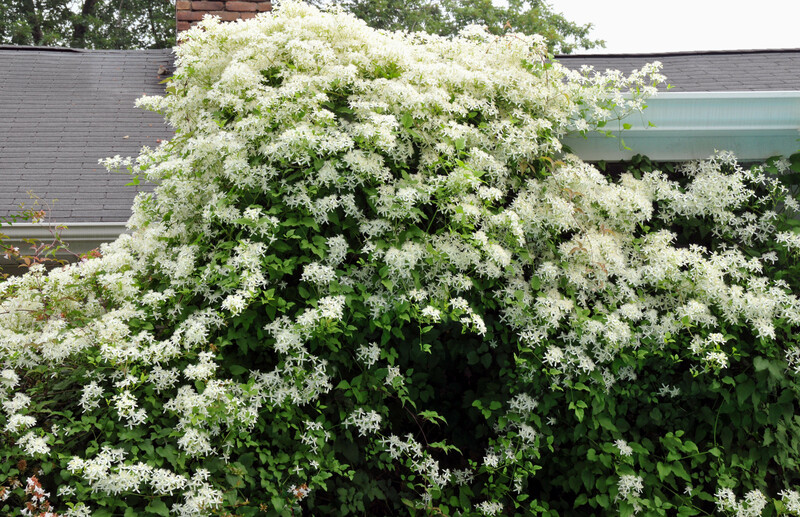 The flowers are so abundant that my neighbor thought I had covered part of our patio roof with a white cloth. We sat outside enjoying the flowers and a little wine during the last full moon. 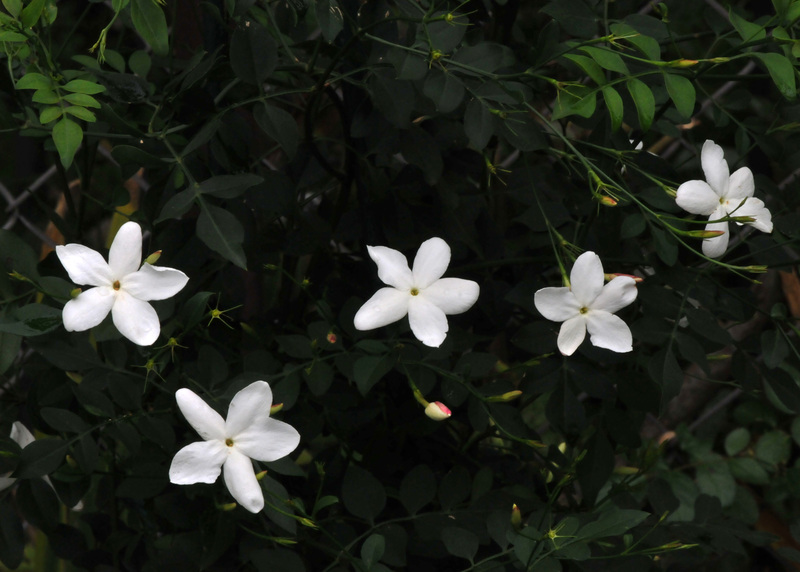 It was quite a show: a blanket of fragrant white flowers under the moonlight. It was a wonderful way to unwind after a long day at work. 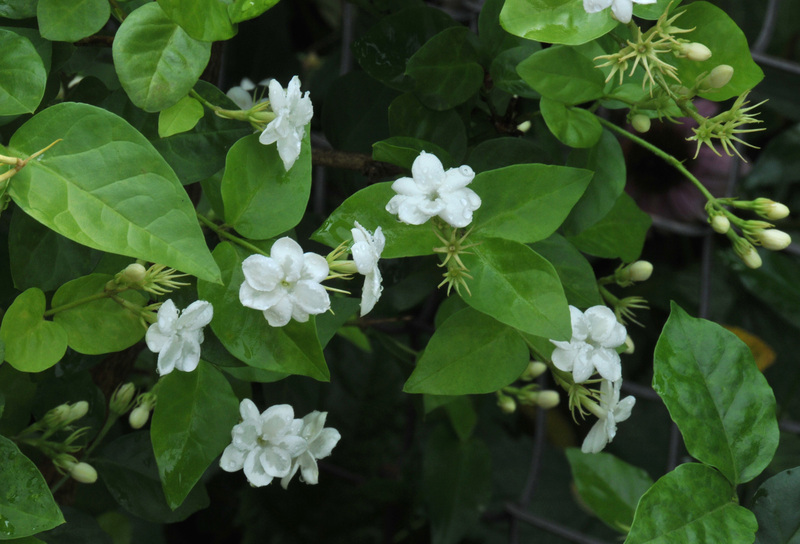 More pluses: It doesn’t require much care, just feed it and give it a good pruning once a year in spring. The bees, butterflies and moths love it. It also provides a hiding place for birds. 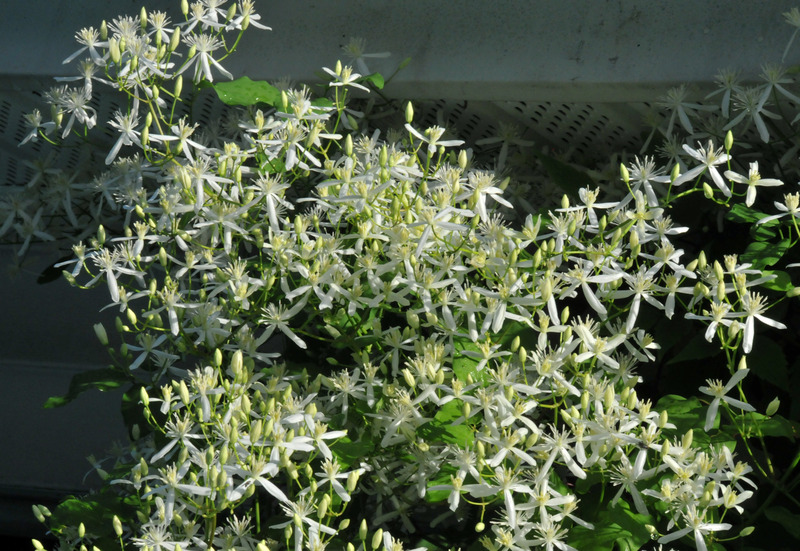 When there is not much else blooming late in the season, this clematis brings life as well as providing food. There is a walkway to the patio, bottom left, that was reduced down to a four foot high gap. This happened in just one season! I’ve been buying one or two stems of Tuberose (Polianthes tuberosa) at the Union Square Farmer’s Market for the last couple of years. 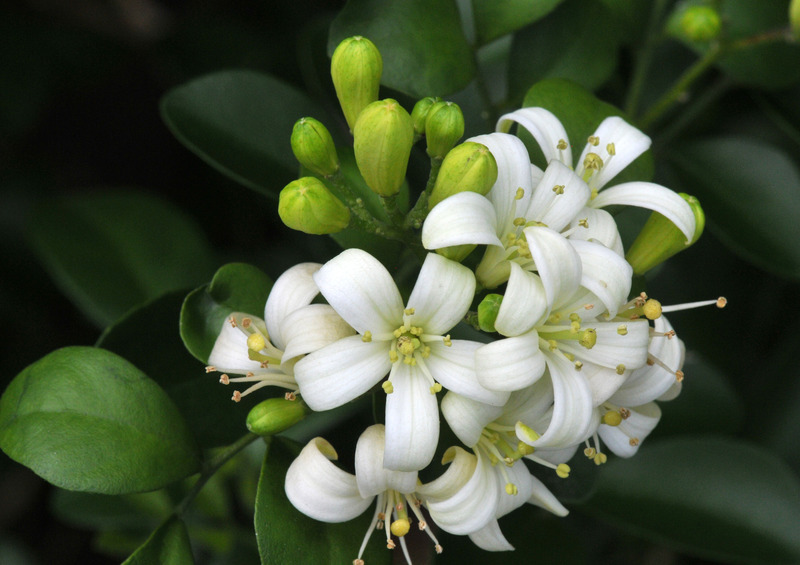 I love its fragrance, very sweet and unique. 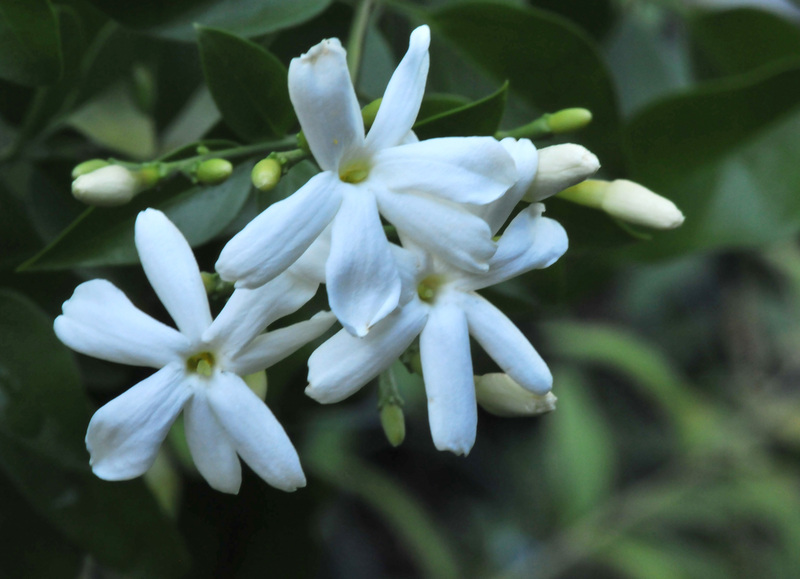 The scent brought me back to my childhood when my grandmother grew them in her garden. The memory of walking in the garden when they were in full bloom will always stay with me. The long stems with pure white flowers that opened up, one or two at a time, like a small version of Gladiolus. I was allowed to cut them just to make an offering, nothing else. I guess it was because it was mainly used in a funeral arrangement over there at that time. 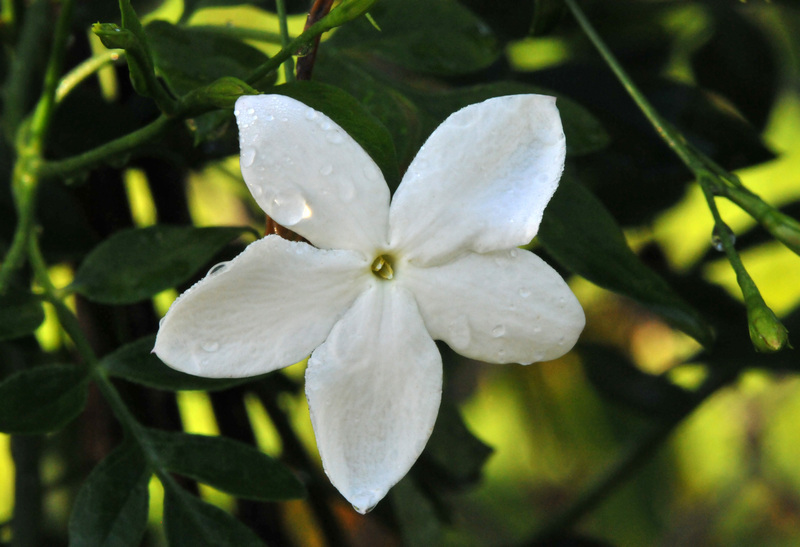 The name in the local language means ‘to hide a smell’. 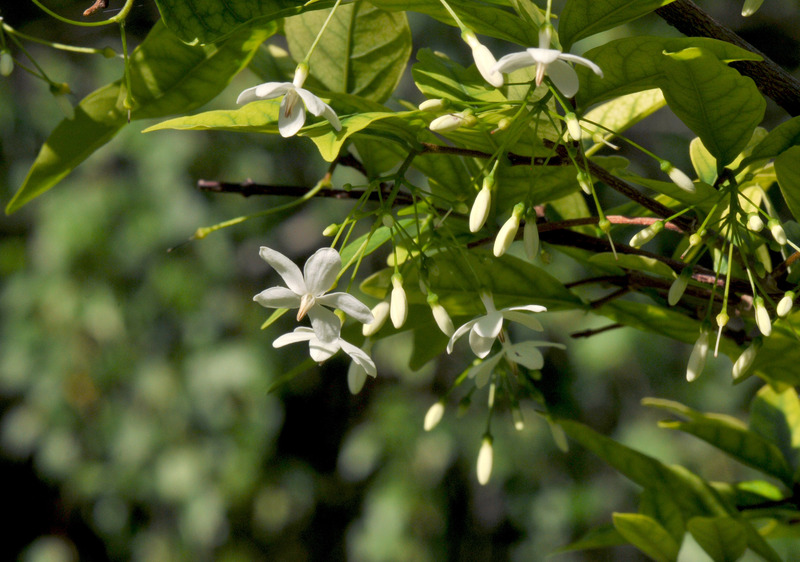 The locals probably used the flowers in the temple during a funeral ceremony before embalming existed, hence the name. 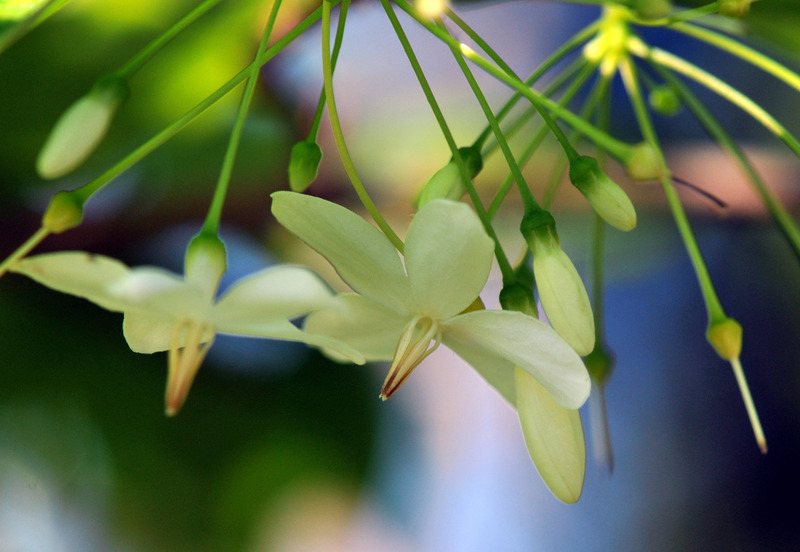 When you put a lot of Tuberose together, you won’t smell anything else but the sweetness of the flowers. It’s like being in a room full of Oriental Lilies or Hyacinths, if you’re not sure how strong Tuberose is. Anyway, I was warned by the farmer who sold me the Tuberose flowers about the difficulty of growing it in this latitude. He said I can grow them but they won’t flower because the hot season is not long enough for the plant to develop flower buds. 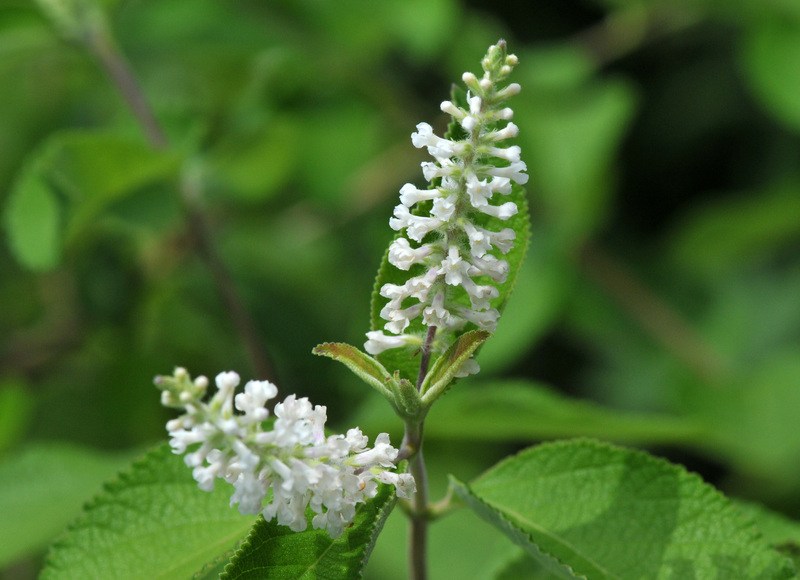 He added that in the Northern part of the US it’s grown successfully only in a greenhouse. His answer discouraged me from trying to grow them for a few years. What have I got to loose? I can’t get Gardenia and Ginger Lily to flower but I still grow them. Hopefully one of these years they will give me a break and flower. 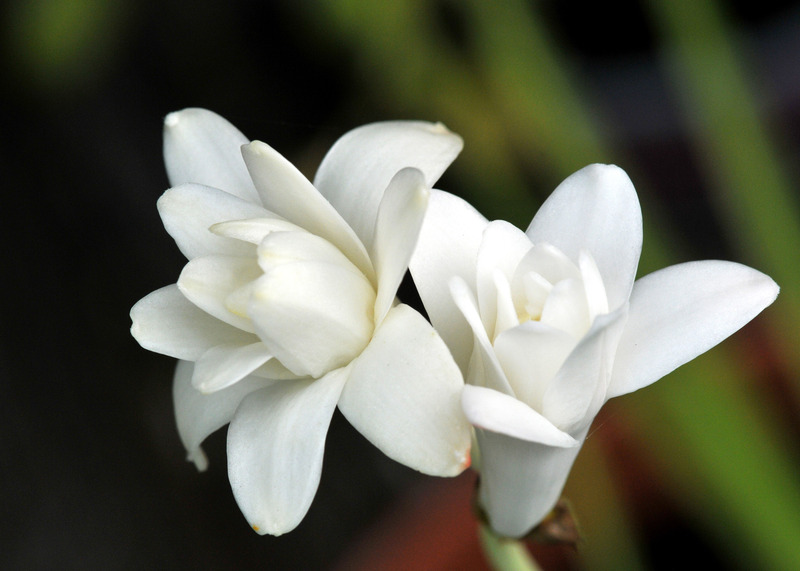 I decided to try growing tuberose this year with three small bulbs. They have taken their sweet time to come up from under the soil but, to my surprise, one of them bloomed. There are just two flowers on the long stem but they are enough to give me hope. I’ve been doing my best to create a garden that have flowers from early spring to late fall, both day and night. It’s getting there but I don’t know when I’ll finish. I’m not going to beat myself up for it since a true garden will never be done anyway; it just evolves. I don’t remember who proclaimed that but it’s a comfort to know that someone out there has the same mentality. 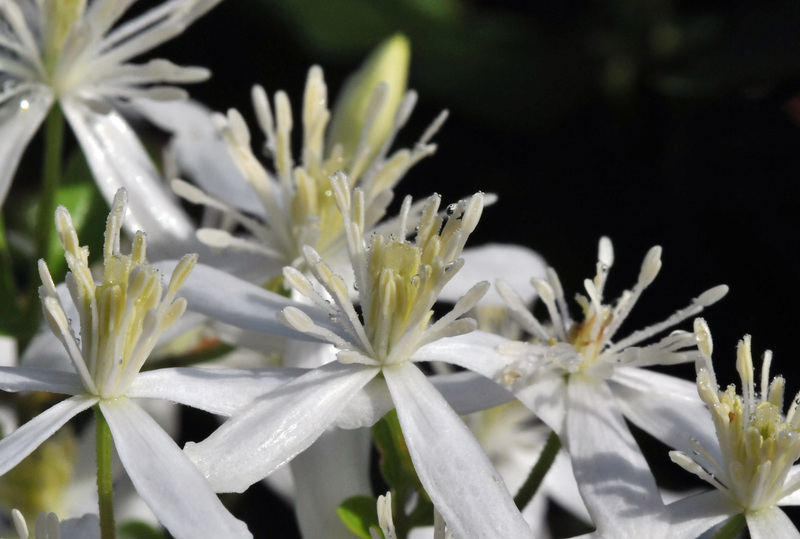 Flowering plants for late spring to early summer are the easiest to find, but there are not that many choices for early spring and late fall. There are even less selections when it comes to vines. 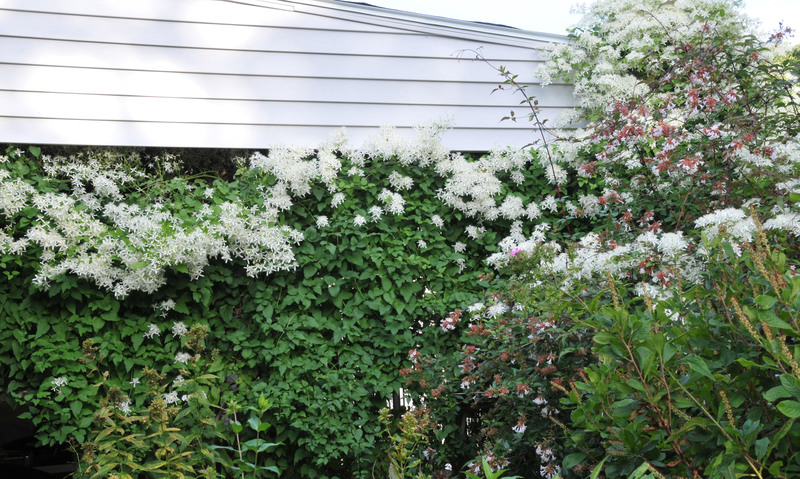 A few years ago I looked for vines or rambling roses to cover our less than attractive, chain link pool fence, hoping to give us some privacy. I found Clematis ‘Sweet Autumn’ (Clematis turniflora) in one of the catalogues and ordered two of them. 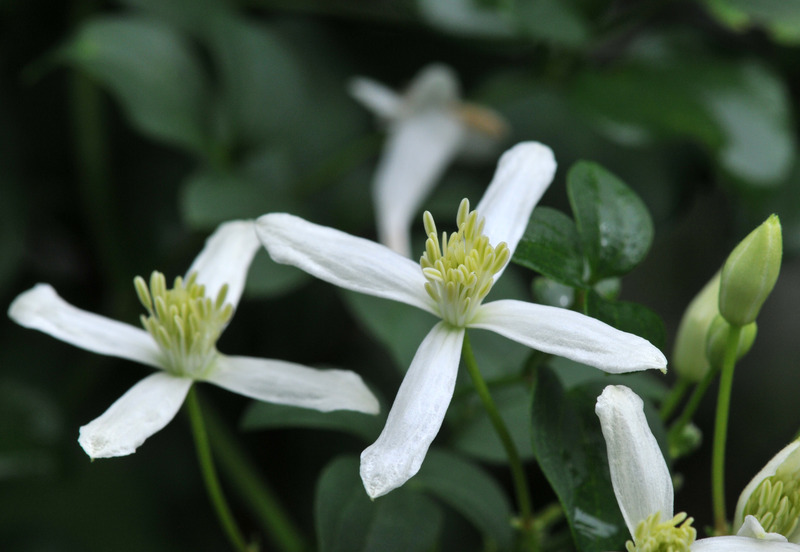 One of them turned out to be something that I didn’t expect…a Clematis ‘Montana’ (Clematis montana var. rubens). This is one rare moment I don’t regret getting the wrong merchandise in the mail. 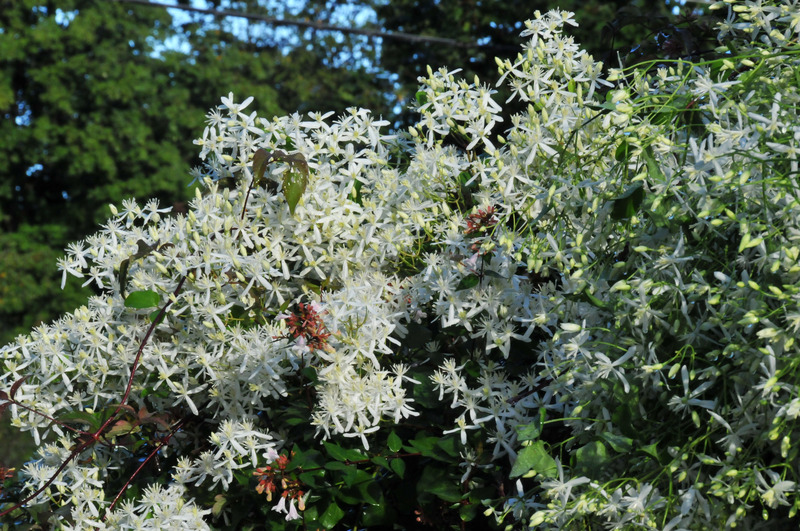 The Clematis ‘Sweet Autumn’ really lives up to its name. 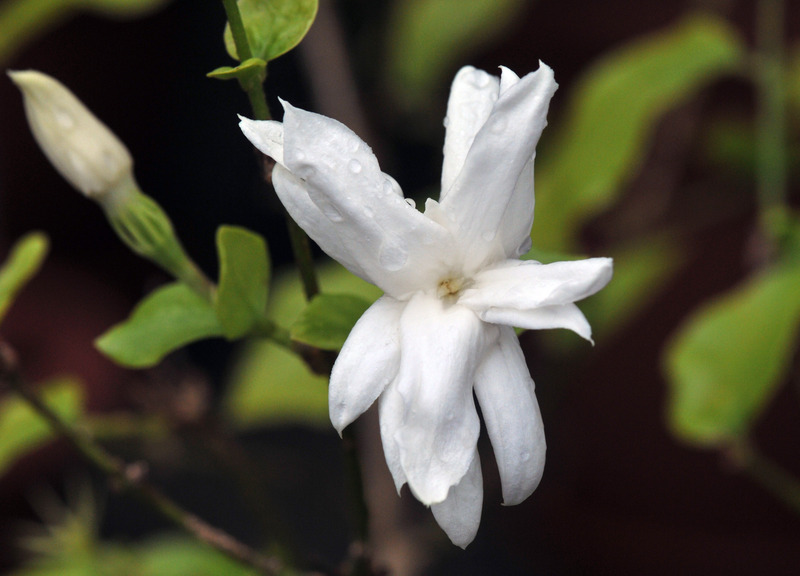 When it blooms it is flooded with small, lightly fragrant white flowers as soon as the temperature drops in September. We have it climbing up to the patio roof so it looks like there is snow covering that corner of the roof. It can grow to 30 feet in a season. I prune it down to the main branch every spring but it grows right back up the roof by mid summer. Here how it looks by early September…..